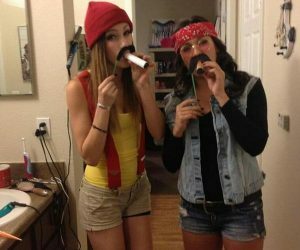 Wow your friends with these insanely creative and expensive-looking DIY Halloween projects with supplies from the Dollar Store. It doesn’t take a lot of money to turn your home into a spooktacular bonanza – with these ingenious and budget-friendly finds, your family and friends are sure to be scratching their heads as to how you made these incredible Halloween decorations. Check out these dollar store Halloween crafts for your inspiration. Turn these surprising objects into mysterious goblets. Cast a shadowy effect on squeaky clean transparent crystal balls by holding them on top of a burning candle. 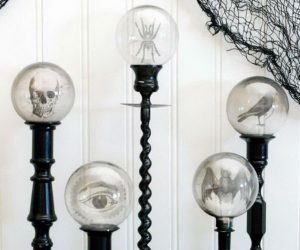 Transfer any creepy print you want – a spider, a crow, or a bat – and place the balls on top of vintage-inspired black candlesticks from the Dollar Store in varying heights. Get the instructions via flamingotoes. Use these plastic pumpkins to turn them into super large spooky eyes. Place them on top of bushes for some creepy Halloween decor that will surely turn heads. 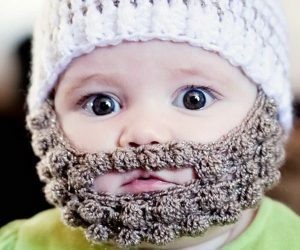 Get the step by step tutorial via kitchenfunwithmy3sons. This super fast DIY project will be done in just minutes. Spray paint these Dollar Store plastic pumpkins in black, and paint the eyes and teeth with glitter. Get the tutorial via eddieross. Simple use Sharpees to doodle creepy eyes into these battery-powered lights. Place them outdoors and you’re sure to spook away possible intruders, or your neighbors. Get the tutorial via southnorthsouth. Turn your used paper towel rolls into these awesome candlesticks by buying some Halloween supplies from the Dollar Store. Ignite your inner crafter and your family and friends will never believe these used to be paper towel rolls. 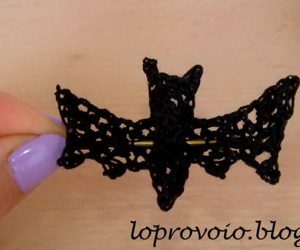 Get the tutorial via houseofdewberry. It looks so elegant yet has that touch of creepy. Another elegant front door wreath to get your creative juices flowing. Cover a basic wreath with these Dollar Store black ravens and you’ve got a super cool Halloween wreath to greet your family and friends. source. Take any pair of plastic dolls from the Dollar Store, paint them in grey, including their hair, wrap them in some tattered piece of fabric, and you’ve got zombie Siamese twin dolls to bring on the creepiness to any area of your home. 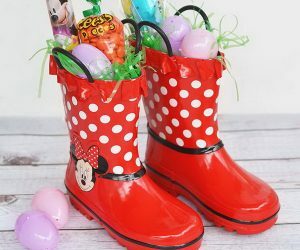 Get the tutorial via justcraftyenough. 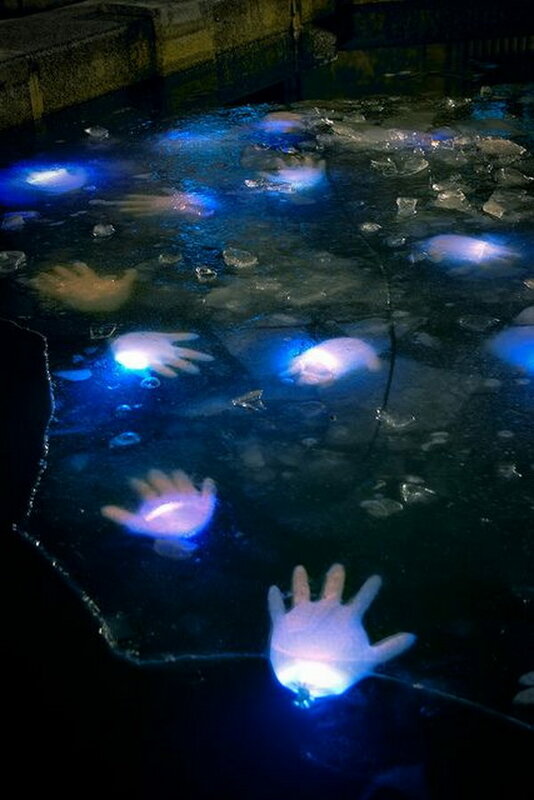 If you have a pond at home, or maybe a small inflatable pool, create this freaky creepy pond by using blown up latex gloves and placing glow sticks inside. via source. 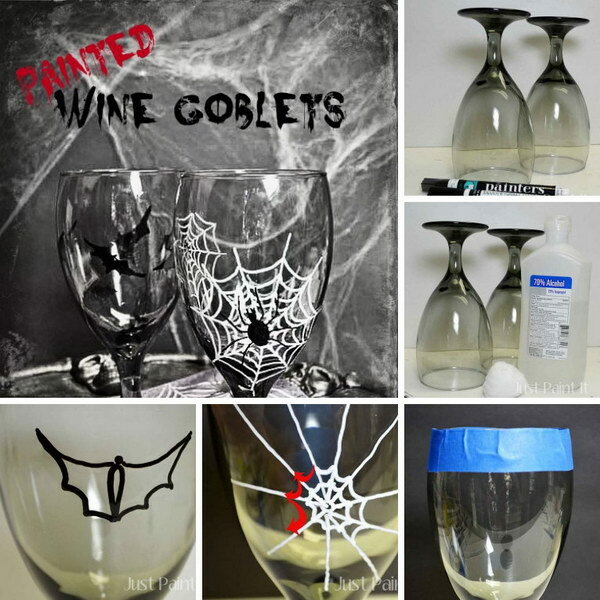 Buy a few Dollar Store wine glasses and decorate the bottom with some spider webs and spiders. source. Pile on three plastic skulls together, top the bottom and top with plastic dishes, and paint everything in black. Place a candle on the top, and you’ve got a super awesome Halloween candle holder to impress your guests. via endlesslyinspired. A mass of spiders is the stuff of nightmares. Create the scene by covering a pumpkin full of spiders, and don’t forget to add a trail for some serious scary appeal. Get the instructions via thekimsixfix. Who wants to see some drab old plastic pumpkin? 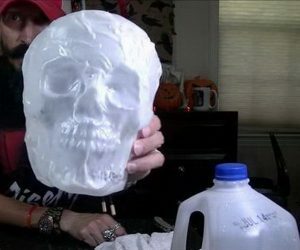 Make your very own creepy concrete pumpkin by using a plastic pumpkin from the Dollar Store as a mold. Get the tutorial via hometalk. 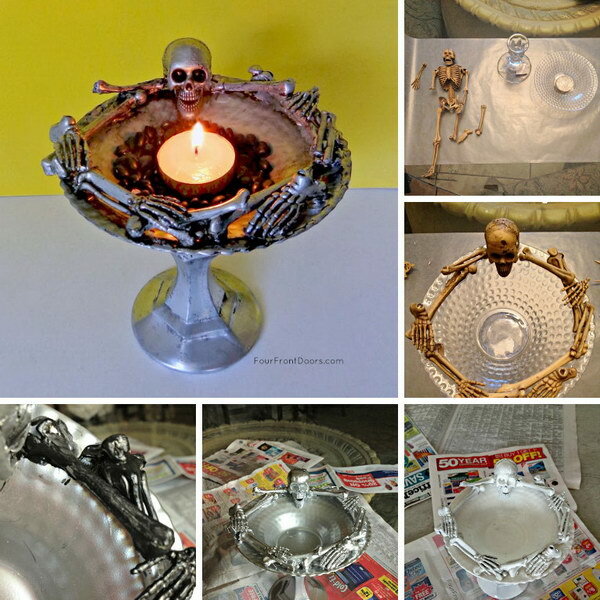 Candles for Halloween are always a staple but you can turn it up a notch by making these super cool skull candlesticks. You can get a pair of candlesticks from a Dollar Store, glue a skull with a candle on the top, and you’ve got an ingenious Halloween decor that’s sure to shock. via capscreations. With just a few plastic Halloween objects from the Dollar Store, some metallic paint, and an old hard cover book, you’ll have an ancient-looking spell and potion book in no time. Add plenty of ghoulish details and your family and friends will certainly think these books are real. via betterafter. Spray paint a $1 plastic pumpkin in the color grey to make it look concrete, and place some flowers or a plant inside. via source. 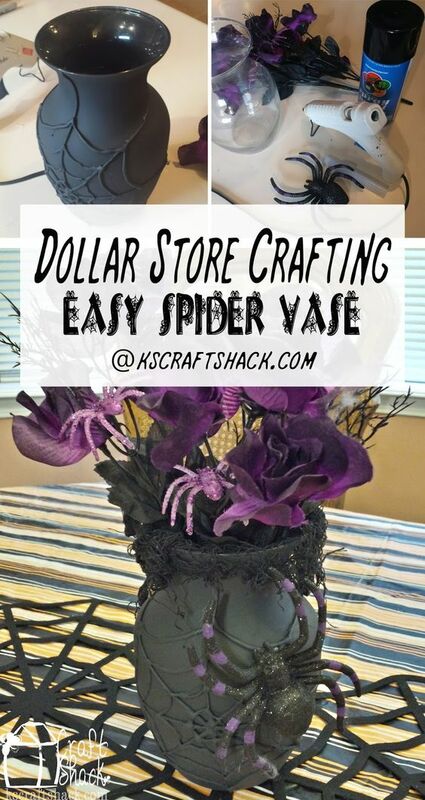 Take a basic glass or plastic vase from the Dollar Store, make a spider’s web with glue stick, and spray it entirely black. Fill it up with purple roses and black twigs, and you’re got a spooky centerpiece that’ll go a long way. And don’t forget the freakishly huge spider for the full Halloween effect. Get the step by step tutorial via kscraftshack. Skulls are always a great idea when it comes to Halloween decorations. They’re classy, weird, creepy, but appeal to both kids and adults. Make this super creative pottery barn bone yard ceramic project and place on tables, bookshelves, and even on the floor. source. 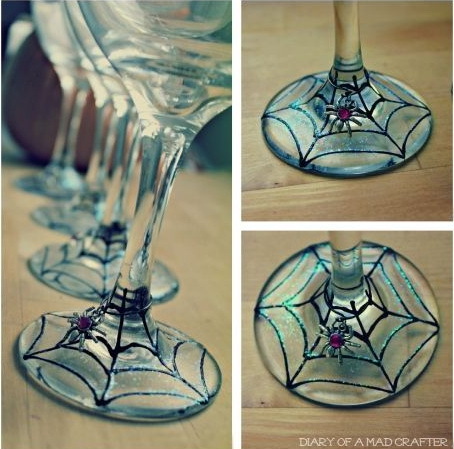 Turn any wine glass to Halloween-appropriate by doodling Halloween themes on the sides. Just don’t forget to leave the upper rim clean so your guests won’t have second thoughts of actually drinking from the glasses. source. Turn your living room into a living dungeon by decorating with these Halloween chains made from Dollar Store pipe insulation. Paint them black and grey for a more realistic effect. via source. If you don’t want the mess of paint and glitter, and all that cutting and pasting, then these magnetic spider project is definitely for you. Simply glue some magnets on tiny spiders and arrange them on walls or on your refrigerator door. Get the tutorial via deliacreates. Wreaths are a staple for front door decorations. But wreaths don’t always have to be pretty. Make this super creative hand skeleton wreath and you’ve got a classy and creepy Halloween decor to welcome your guests. Get the step by step tutorial via eighteen25. Showcase a collection of oddities with these super creative bell jars. Buy some really cheap Halloween objects and animals, place them inside or cover them with glass jars, and you’ve got a curious case of creepiness that’s super classy and super creepy at the same time. Get the tutorial via thepinjunkie. Make a few Halloween village scenes with cut out board paper, candles, and of course, these pumpkins to hold everything in place. source. Wrap any Dollar Store vase with these awesome tiny skeletons and decorate with twine for a creepy vase that you can place on coffee tables or your home office. Get the tutorial via source. Take a tiny skeleton apart and glue around a basic dish. Spray paint everything in white and an ultra-cool dish is yours to serve some treats to trick-or-treaters or your party guests. Get the instructions via fourfrontdoors. 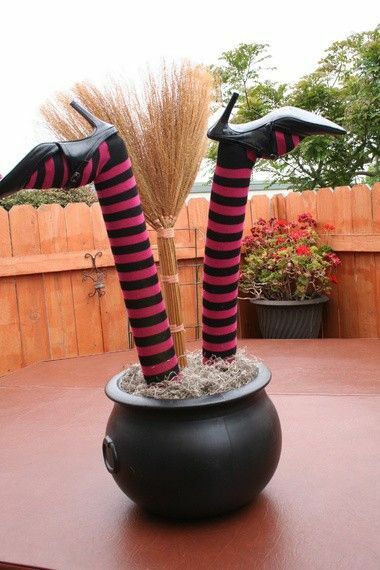 Turn a couple of witch’s brooms from basic to awesome by spray painting them in dark colors. Don’t forget to add on the glitter for some added sparkle. via source. Got some old black kitten heels lying around? Then make this super easy and super fast Halloween decor. All you need is a couple of pool noodles and cheap striped stockings from the Dollar Store and a super funny decor is yours to display. Via source. Decorate these fake apples on the dining table for your party. Using some supplies from the Dollar Store, take Snow White and the Evil Queen to your dinner party with this creative take on Halloween decor. 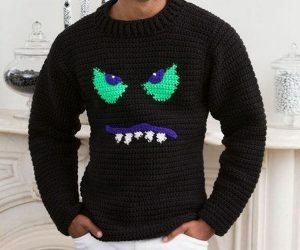 via letsgetthrifty. Turn any Dollar Store vase into a mummy by wrapping it in gauze and adding some googly eyes. via source. Simply glue some butterfly wings on tiny skeletons and place them everywhere in your home for some subtle Halloween decor that’ll surely surprise. Get the instructions via halloweenforum.